On-going discussions are taking place between U.S. and European Union (EU) experts concerning the future GPSIII L1C and Galileo E1 OS civil signals. An agreement on a common power spectral density (PSD) known as multiplexed binary offset carrier (MBOC) recently emerged as a solid candidate to replace the current baseline: BOC(1,1). In order to comply with the MBOC PSD, two candidate implementations, known as time-multiplexed BOC (TMBOC) and composite BOC (CBOC) modulations, have been proposed. If fully exploited, these implementations will provide improved performance but require a more complex receiver architecture than a BOC(1,1) receiver. 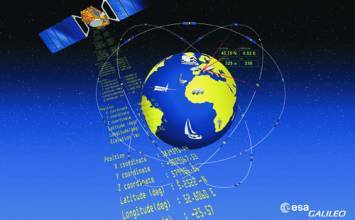 Increased complexity and associated higher costs, however, might be detrimental for a GNSS receiver manufacturer that would like to use MBOC, but with limited modifications to their receivers — particularly for those companies producing equipment for mass consumer markets. This article aims at evaluating a new CBOC receiver architecture using locally generated TMBOC-like signals that will result in a simpler architecture comparable to a BOC receiver. The normalized MBOC PSD includes the whole of GPSIII L1C or Galileo E1 OS civil signals, which means both their data and pilot components. • CBOC, which linearly combines BOC(1,1) and BOC(6,1) sub-carriers (both components being present at all times), and appears to be the leading candidate for the Galileo E1 OS signal. The philosophy behind these two modulations is very different, and, although they would theoretically produce equivalent tracking when used with a TMBOC or CBOC receiver (considering pilot and data channels), they can result in different performances in other configurations (for instance, considering the pilot channel only). A major difference between the TMBOC and CBOC modulations is that the CBOC sub-carrier, as the weighted sum of two squared-wave sub-carriers, will have four different levels. Consequently, this means that an optimal CBOC receiver has to generate a local replica that also has four levels, resulting in a local replica encoded on more than just one bit. This could complicate the CBOC receiver architecture and might prove detrimental to the widespread use of this modulation for certain types of receiver, if retained as the Galileo E1 OS modulation. This article describes an innovative technique that only requires a 1-bit local replica, very similar to a TMBOC waveform, to track CBOC signals. This method is particularly interesting because, despite its simple implementation, it has only limited losses in tracking performance with respect to traditional CBOC or TMBOC receivers. Moreover, it shows excellent performance when compared to the previous GPS/Galileo L1 baseline signal, the BOC(1,1). The first part of this article describes the possible CBOC and TMBOC candidates for Galileo E1 OS and GPS III L1C modulations. The second part looks at the traditional tracking performances of these two modulations in terms of thermal noise and multipath-induced errors. Finally, we introduce the new 1-bit tracking technique and compare it against optimal CBOC and TMBOC tracking in terms of tracking noise and multipath resistance. Following the US/EU MBOC agreement, the current main candidates for the GPSIII L1C and Galileo E1 OS have been introduced. In particular, the pilot channels have been analyzed with their use of the new CBOC and TMBOC modulations. Although adding a very small amount of BOC(6,1) to the previous BOC(1,1) baseline, it has been shown that the tracking performances of these future signals are significantly improved compared to pure BOC(1,1) tracking. In particular, tracking noise is reduced by 2.4 to 3 dBs in terms of equivalent C/N0, and multipath mitigation is significantly improved. Focusing on the CBOC modulation, its multi-level waveform could result in more challenging receiver architecture. 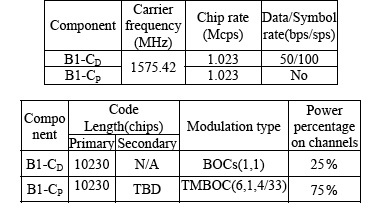 In order to keep a simple receiver design to receive a CBOC signal, a new tracking technique, referred to as TM61, has been proposed to allow tracking of the CBOC modulation with a 1-bit only locally generated replica. This method uses time-multiplexing of BOC(1,1) and BOC(6,1) sub-carrier on the same model as the TMBOC modulation. A preferred implementation of TM61 is the use of a pure BOC(1,1) sub-carrier for the prompt correlators and a pure BOC(6,1) sub-carrier for the early and late correlators (a DP discriminator being assumed). This yields a much simpler receiver architecture since it requires only pure sub-carriers with no-multiplexing (different from TMBOC receivers), 1-bit local replicas (unlike a CBOC local replica) and a minimum of correlators. Please note it is also possible to use another implementation of the TM61 tracking methods with time-multiplexing. In its preferred implementation, TM61 brings only a slight post-correlation SNR degradation (about 0.35 dBs for the selected CBOC main candidate for Galileo pilot channel), enabling good phase tracking. TM61 code tracking noise performance is degraded with respect to traditional CBOC tracking by approximately 2.4 dBs. However, this has to be put into perspective considering the substantial reduction in receiver complexity with TM61 and the fact that thermal noise might not be the main source of error for many applications. Finally, the TM61 tracking technique has been demonstrated to provide, in its preferred implementation, a better multipath resistance compared to traditional CBOC tracking. In any case, the use of TM61 to receive a CBOC signal has been shown to significantly outperform the traditional reception of a pure BOC(1,1) with equivalent power, thus supporting the use of the modernized CBOC signal. Consequently, it seems to be a very good tracking technique for implementation in future CBOC receivers. For the full article, including graphs, figures, and additional resources, download the PDF above.